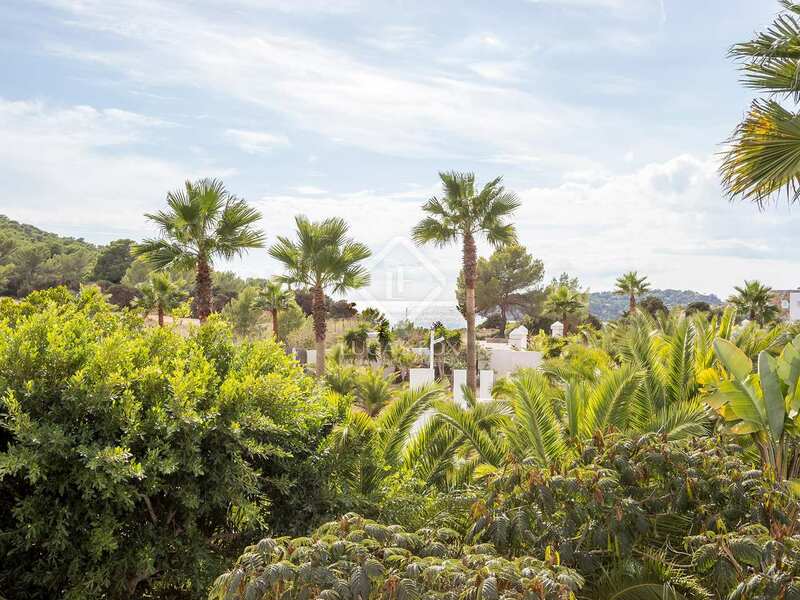 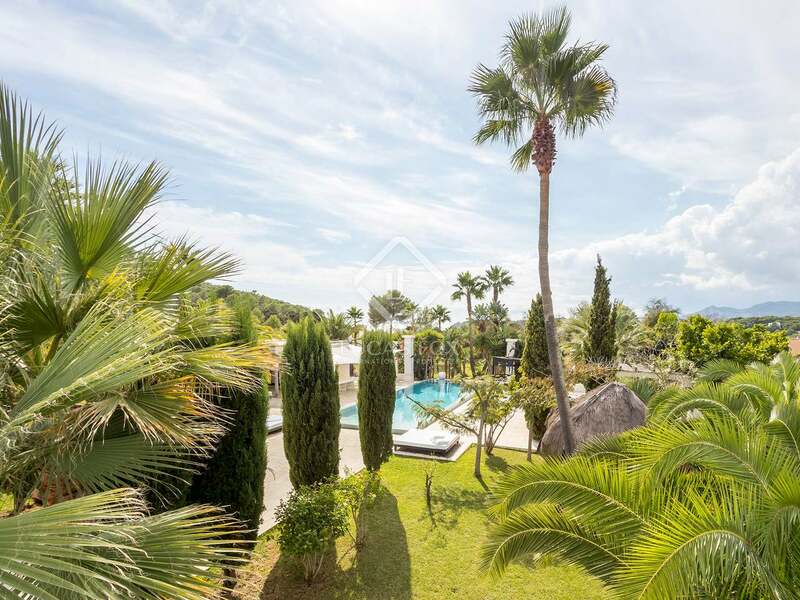 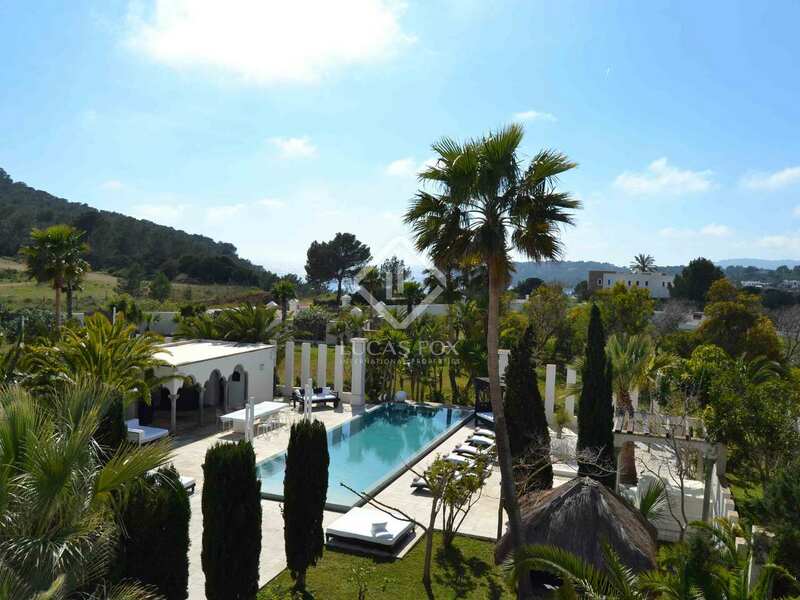 Magnificent luxury mansion, former residence of many celebrities, with impressive outdoor spaces and high-end modern interiors for sale 5 minutes from Cala Jondal beach. 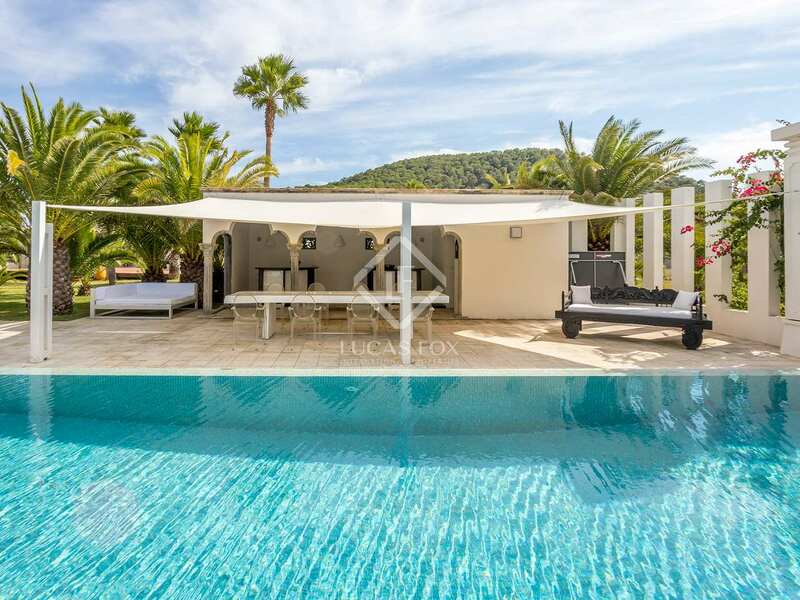 Close to Cala Jondal, on the white island of Ibiza, we find this luxury modern mansion with sea and mountain views which has been home to several celebrities and enjoys an exclusive location 5 minutes from the beach, 15 minutes from the airport and 20 minutes from the centre of Ibiza Town. 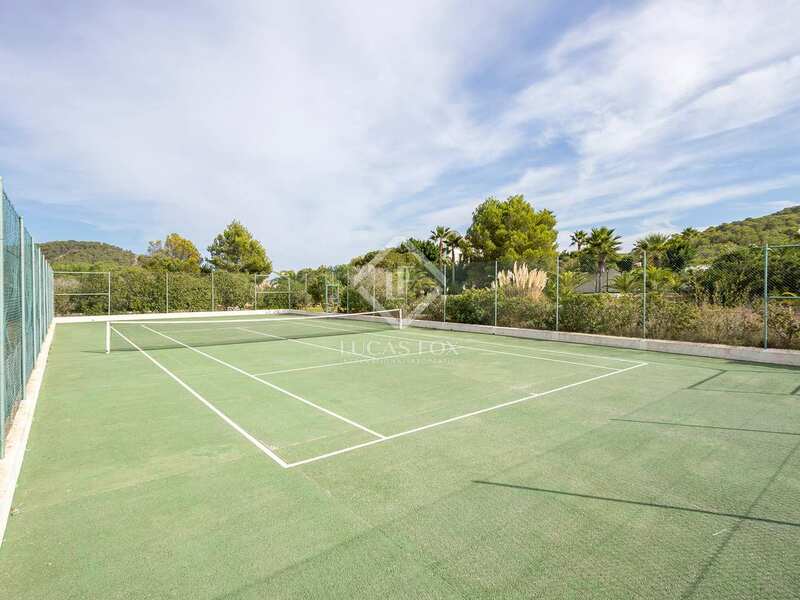 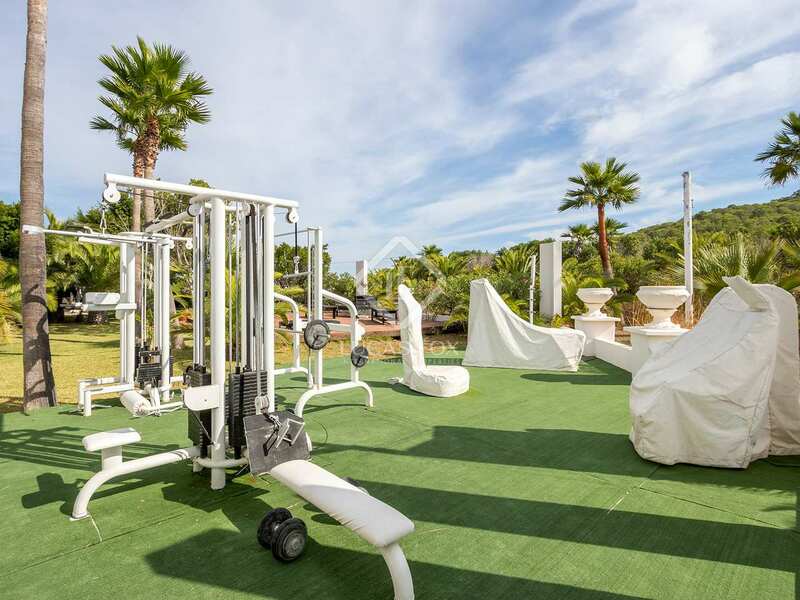 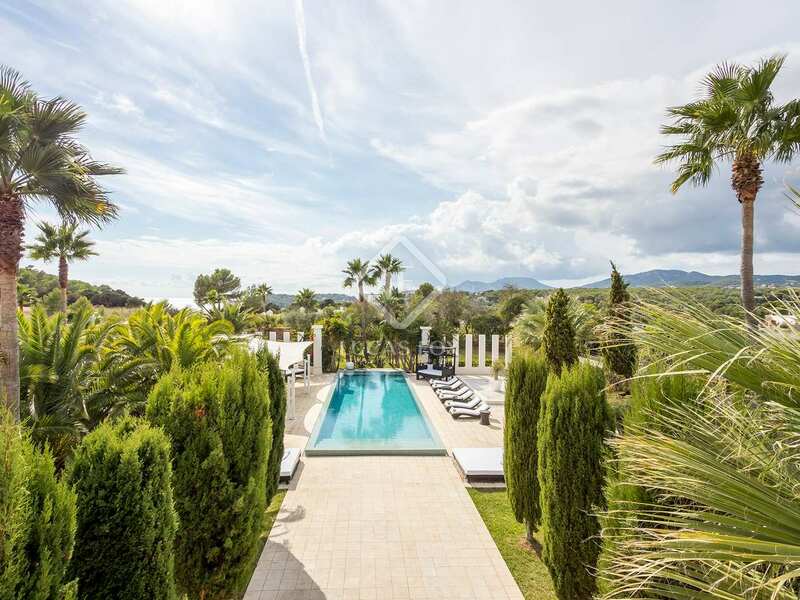 Outside we find an impressive elongated swimming pool complete with DJ turn tables, tennis courts, parking facilities for 18 cars and a plot with no less than 300 palm trees. 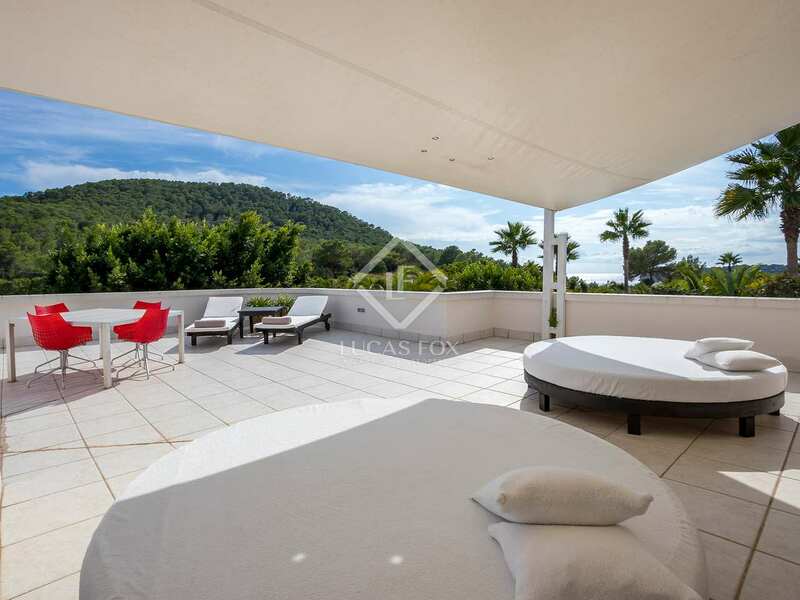 The outdoor spaces are highly luxurious and ideal for relaxation in complete privacy and comfort. 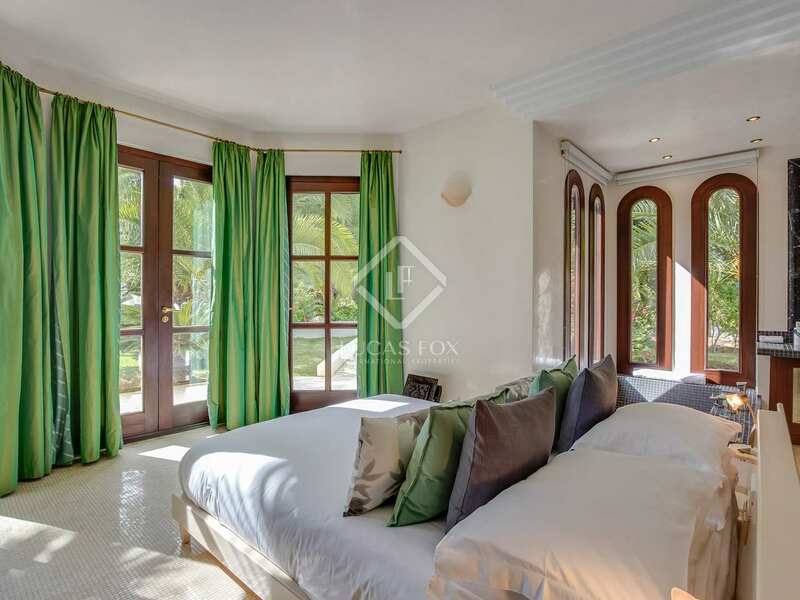 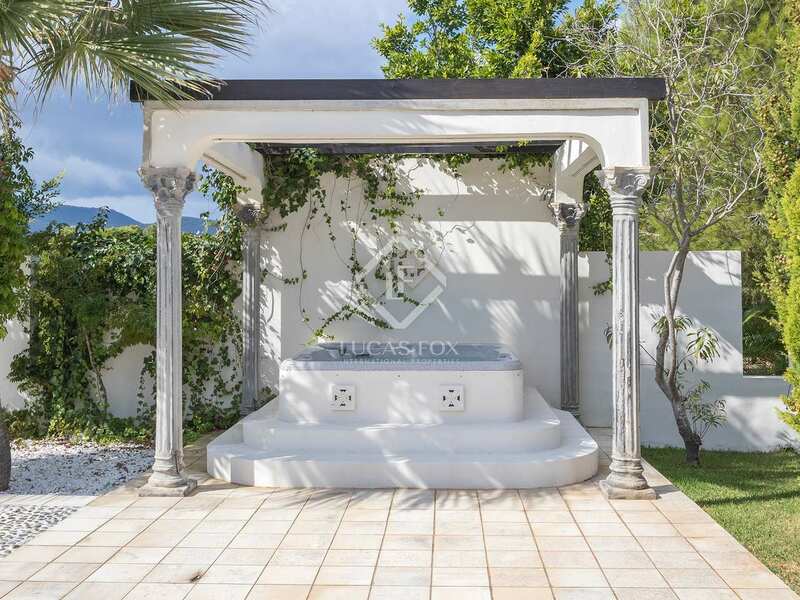 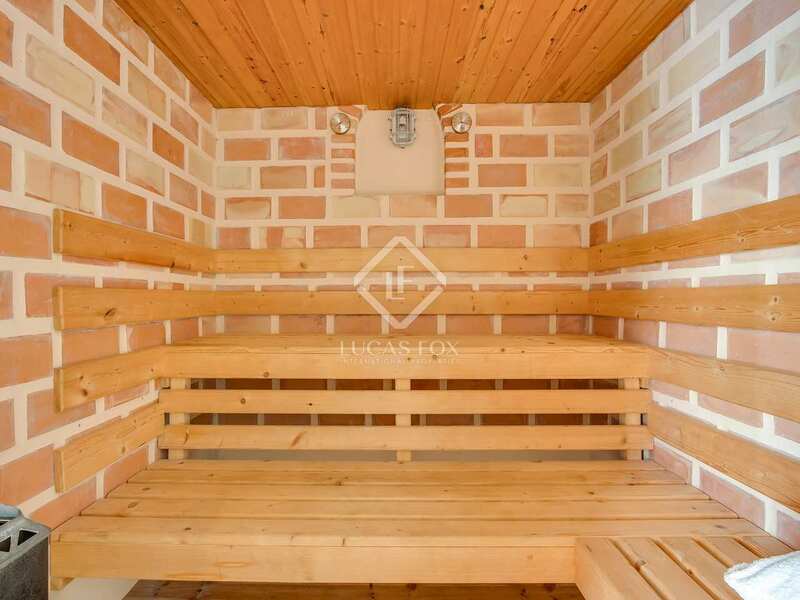 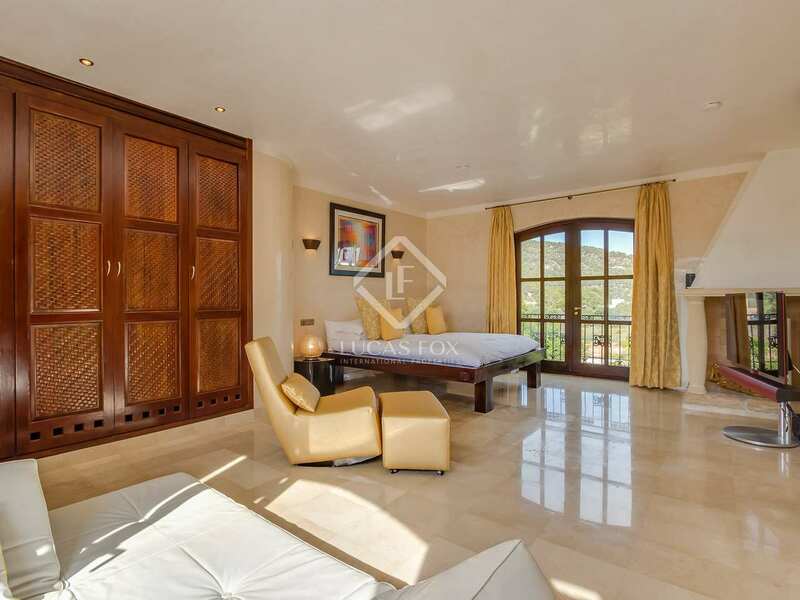 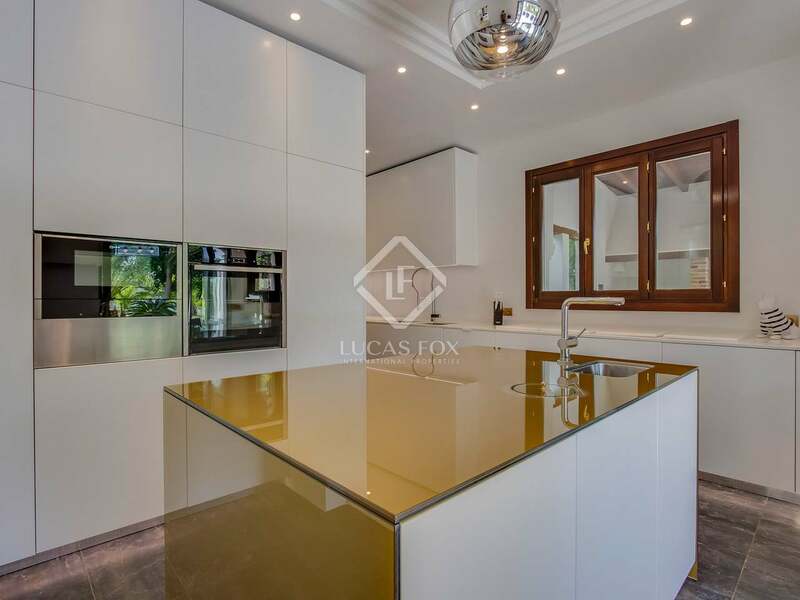 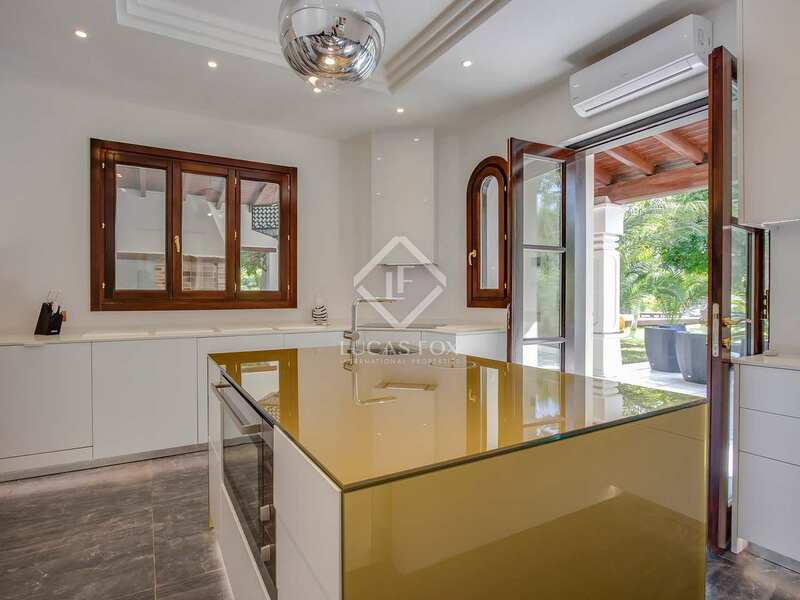 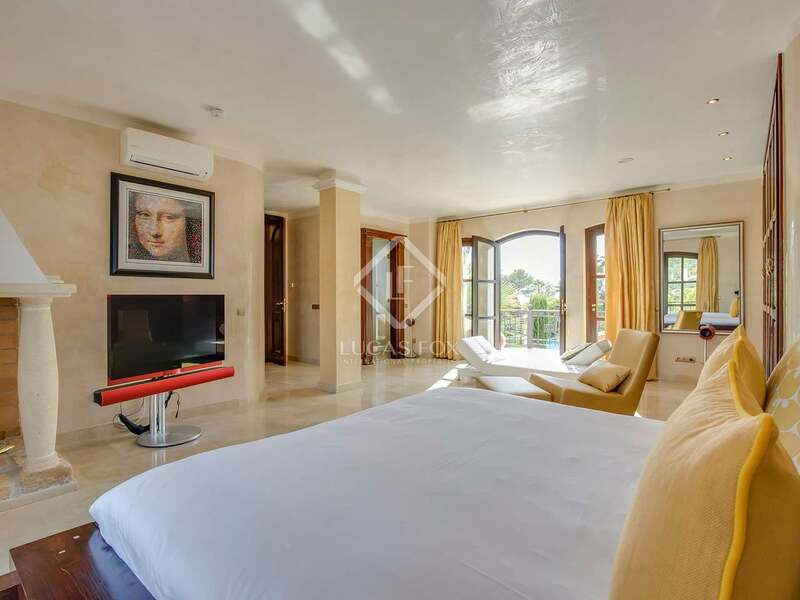 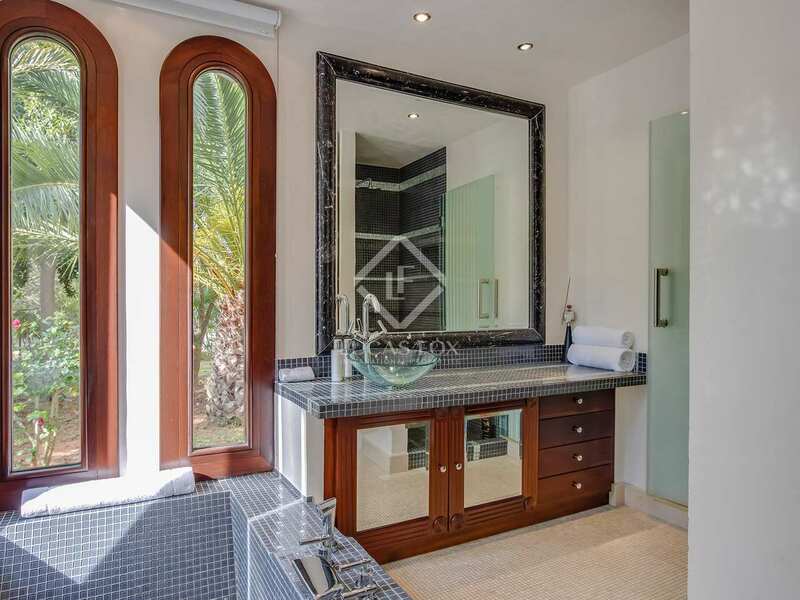 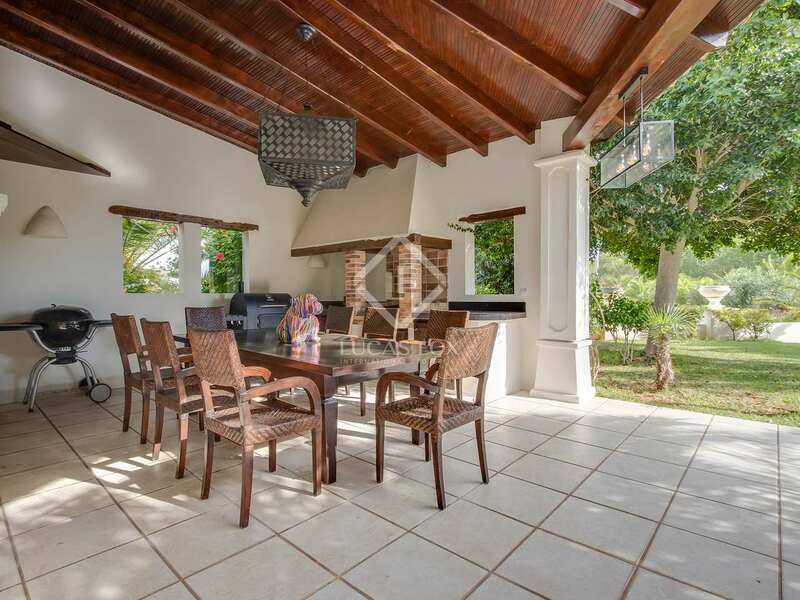 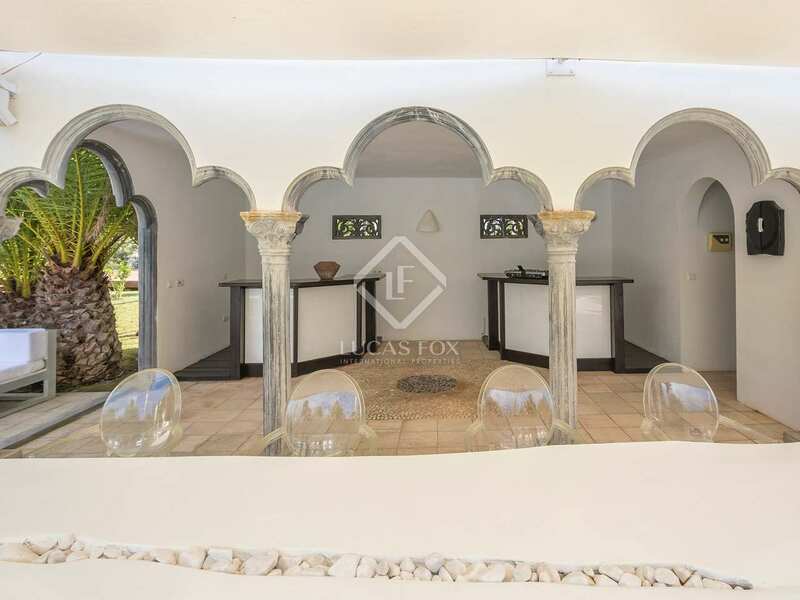 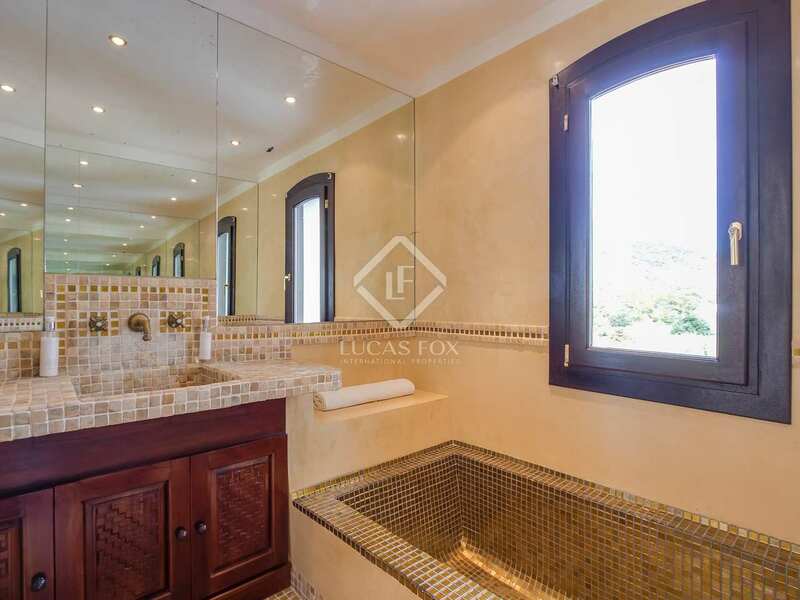 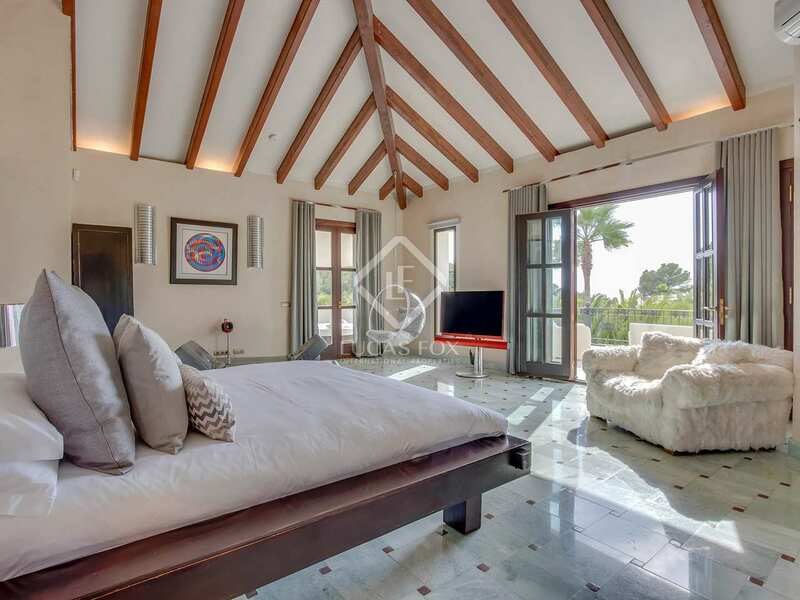 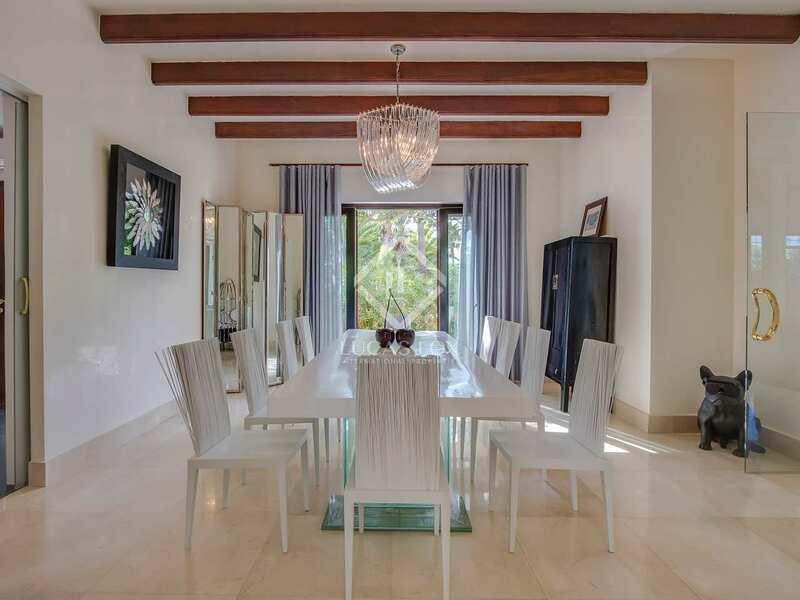 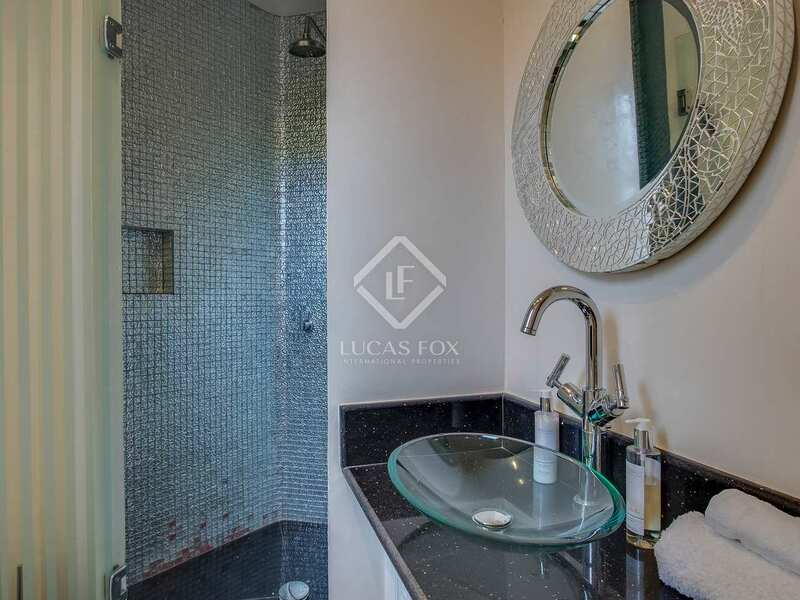 Built in 2002, this contemporary style villa has been completely renovated with high end materials such as marble, Venetian stucco, Bang & Olufsen sound system throughout the house and even gold tiles in the bathroom. 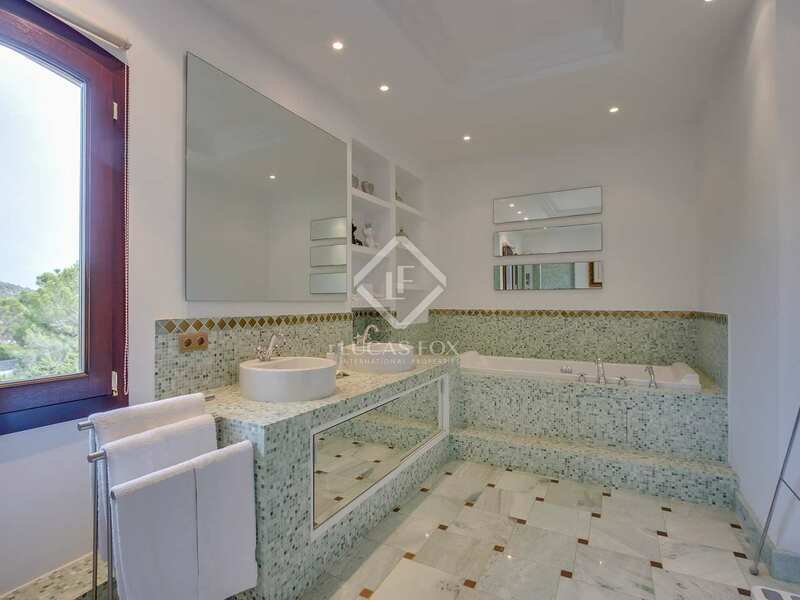 On the entrance level we find a grand hall with a guest toilet with little bookshelves. 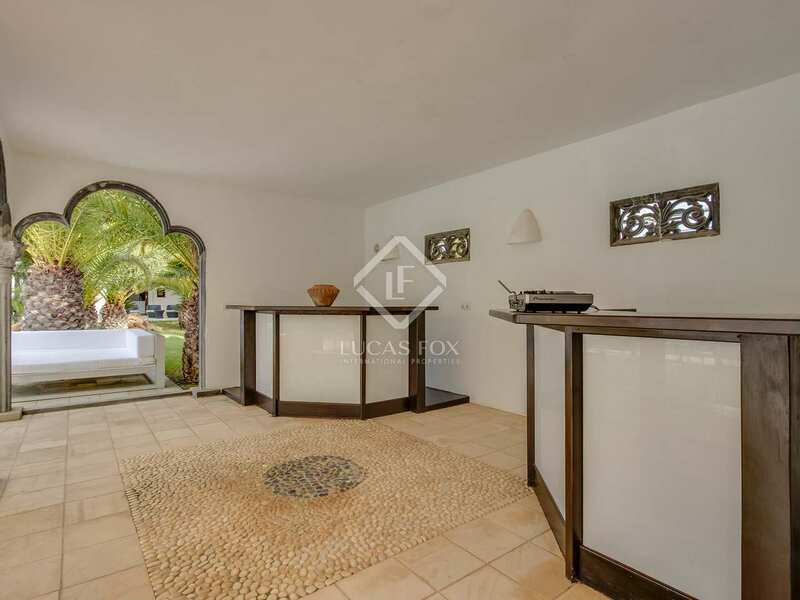 Moving forward we find the kitchen, the lounge with high ceilings and patio doors out to the pool with its own bathroom, a gym, sauna, jacuzzi and tennis court. 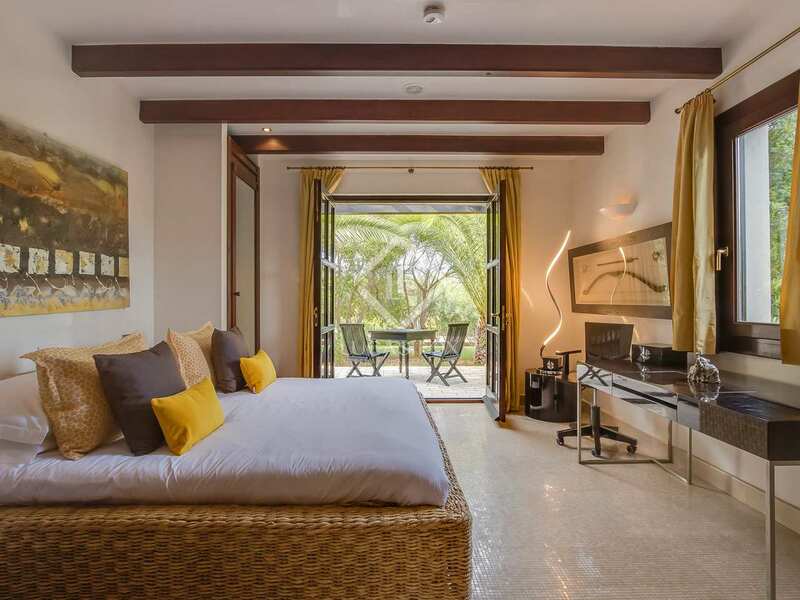 Upstairs are the remaining 4 bedroom suites, each with their own bathroom and balconies over the pool, with sea and mountain views. 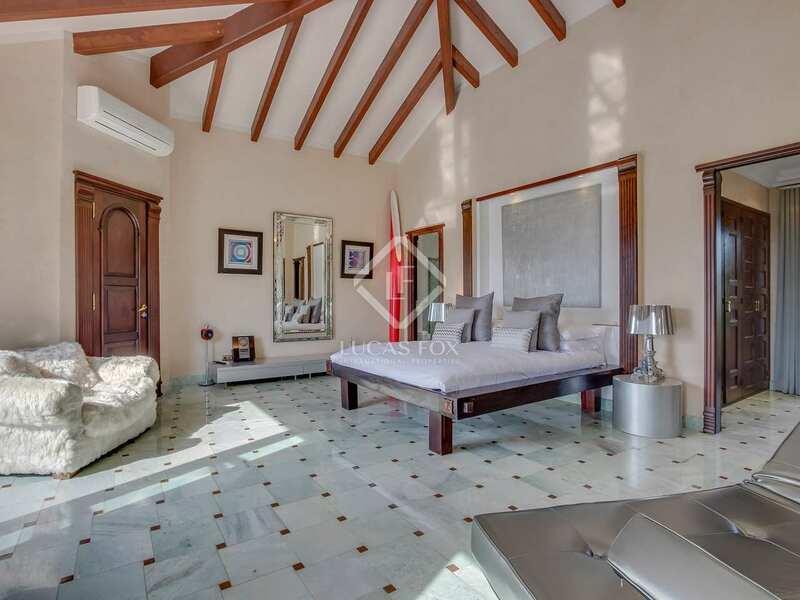 Additional features include the 1-bedroom, 1-bathroom guest house or service quarters which is an annex on the left side of the main house, the pool table, garden lighting, outdoor dining area and paintings with series numbers imported from Miami. 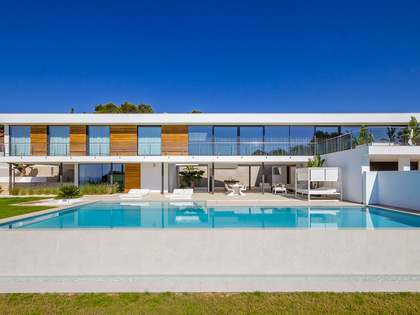 A simply marvellous holiday residence in Ibiza. 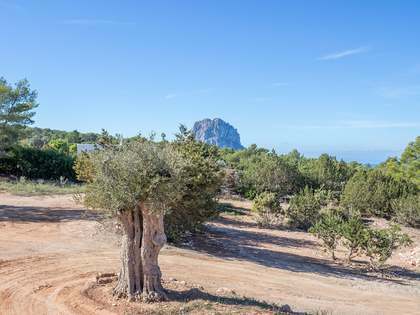 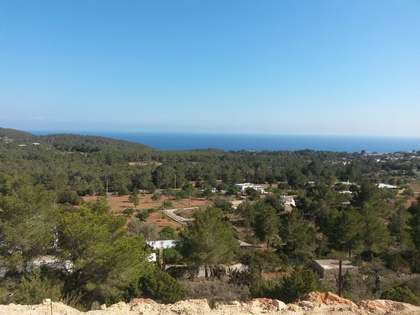 Property close to Cala Jondal, Ibiza, 5 minutes from the beach, 15 minutes from the airport and 20 minutes from the centre of Ibiza Town.